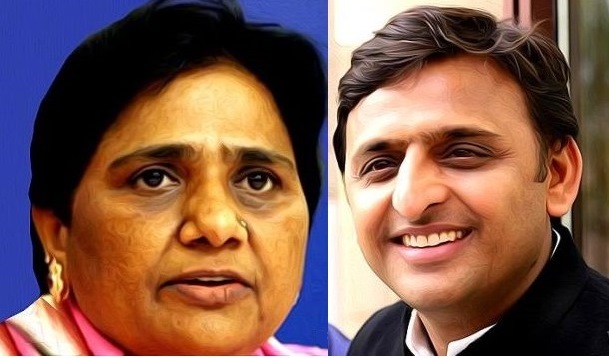 Lucknow: Amid speculation of seat sharing formula between the Samajwadi Party and Bahujan Samaj Party for the 80 Lok Sabha seats in Uttar Pradesh, both the party leaders have denied of any such decision so far. "Talks were initiated in New Delhi on Friday evening between leaders of both the parties but there was no such decision on the seat sharing," a senior SP leader told UNI on telephone from New Delhi on Saturday. He said that from the SP side party president Akhilesh Yadav, Prof. Ram Gopal Yadav and Rajya Sabha member Sanjay Seth were present in the talks. But the leaders who represented BSP could not be ascertained. "It is too early to decide on the seats and similar more meetings would be held to discuss the issue," the leader said.The meeting was held at the residence of BSP president and it continued for over three hours. A BSP source also denied about the finalisation of seat sharing and said that Ms Mayawati would take a decision when she comes to Lucknow next week. Ms Mayawtai would be in Lucknow for the celebration of her birthday on January 15. Earlier, it was reported from Delhi on Friday night that both SP and BSP would contest 37 seats each and leaving two for the RLD , another two( Amethi and Rae Bareli) for the Congress while remaining two for some smaller regional parties.